At Skillshare, we believe that access to learning is a basic human right. The idea of taking out your wallet every time you want to learn something is an outdated model. There is an abundance of things to learn online, and a curious person will want to learn all of them. We believe in making that possible. In the digital content space, we’re seeing a trend towards accessibility. We’ve seen it happen in entertainment (Netflix), in publishing (Oyster), in music (Spotify), and we’re seeing it happen in online learning with Skillshare. There's a high upfront cost of creating great content (time, expertise, resources) but as we've seen repeatedly across industries, the low marginal cost of delivering digital content drives prices down in the long-run. As the marginal cost of consumption decreases, charging each student as much as possible isn’t sustainable. Fair pricing is where innovation happens and how entire industries get disrupted. This is a win for students. Even with marginal costs dropping, it’s still important that teachers (and creators) be compensated fairly for their hard work. This is why we charge $10 a month and why 50% of our membership fees go directly into a royalty pool that gets distributed to our teachers. To date, we have paid out over $5M to our teachers with many more making over six-figures annually. This is a win for teachers. We believe strongly that teachers should be compensated for their time and their skills. We also believe in making learning accessible to everyone. The best way to achieve both is to have the cost of learning split across a really high volume of paying students instead of charging a smaller number of students an extremely high price.Lowered student prices have led to an increase in volume for teachers, which results in more teacher revenue and an increase in student reach and access. Today, online learning is kind of like the Wild Wild West. In the pay-per-class model, teachers get to price their own content, which introduces a wide range of pricing without any clear industry standard. On top of these classes being extremely expensive, it feels arbitrary and confusing. This is motivated by a strategy around “max pricing”. In a new market, the seller tries to price against the value of their product/service by charging as much as the market will allow. This price holds until a competitor comes through and disrupts their pricing model. Today, online teachers are pricing digital content against the cost of a college education. With student debt rising and the average private college tuition at $31,231, a class that costs $300 looks like a steal! Just a few years ago, the most expensive book in the Kindle store was $6,232 (and that included a 20% discount.) 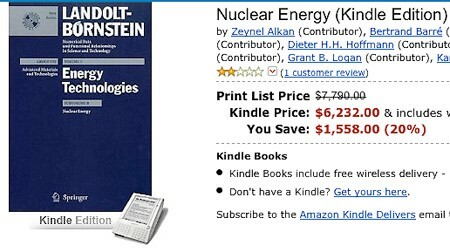 Could you imagine paying that much money for an e-book today? The education model is no exception when it comes to digital content. The most expensive online class I have seen is over $5,000. This needs to stop. Paying per class is a bad student experience. Putting up a barrier to every possible learning experience undermines the nature of curiosity. Like a lot of things on the Internet, the best learning is serendipitous — happening upon something you might not have been looking for (and so have no incentive to buy) which ends up unlocking a new passion or idea. We learned this the hard way. The first 3 years of Skillshare were based on an a-la-carte model. But as we continued to grow, the writing was on the wall — a la carte is not the way of the future. Sustainability. Subscriptions encourage a steadier stream of student enrollments and revenue over time for our teachers. There are two key innovations that have happened in online learning over the past five years. The first is that there are classes online, which makes previously inaccessible learning now accessible to anyone regardless of location. This is awesome. The second (more interesting) innovation is that the lecture is no longer the central node of the learning experience. Instead, the most valuable learning happens when students connect with one another. This means the quality of the learning experience increases for each student with a higher volume of overall students. In the past, the more students in a class, the worse the learning experience would become. Obviously, a model that asks students to pay per class de-emphasizes volume in favor of high-value transactions, which undermines not only the community value of learning, but also learning in general. Skillshare is different because our core learning experience works through our community. More questions, more students sharing, giving feedback, more content created — it’s incredibly powerful. Today, we have over 60K student projects created by our community. Our vision is to unlock the world’s creativity, and we are constantly working to dismantle the traditional barriers to learning to provide access to students all around the world. Today, we offer over 1,500 classes across many different creative skills, including design, photography, and business. For $10 a month, students get unlimited access to any and all classes. If $10 is inaccessible, we offer annual memberships to students through our scholarship program. Skillshare is a community for lifelong learners, and we will continue to dismantle all barriers to making that vision a reality for students around the globe. It’s just a matter of time before the rest of our industry catches up. Top image credited to to Nu Bkds for her project "Blooming Smells" in the class, Pattern Design I: Creating Inspiring Repeats with Elizabeth Olwen. Newer PostShare the Skillshare Love and Earn Money with Our Affiliate Program!